Korey Nolan built an award-winning surfboard made from Dunkin&apos; foam cups. America may run on Dunkin’. But Korey Nolan? He surfs on it off the Atlantic Coast. 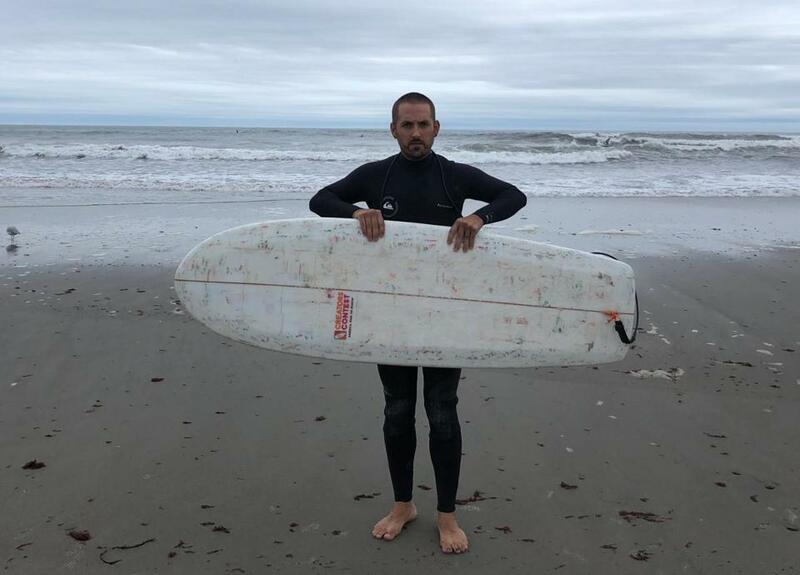 The 32-year-old New Hampshire resident is the creator of an award-winning surfboard that he custom built using nearly 1,000 polystyrene foam Dunkin’ cups, an environmentally conscious project that took him almost a year to complete and has earned him high praise for his ingenuity from those in certain surfing circles. Nolan first tested the contest’s waters in 2017, when he constructed a surfboard fin using acrylic waste materials plucked from scrap heaps at the sign shop where he works as a graphic designer. The fin, however, didn’t exactly make waves. But it wasn’t a total loss. The first-place winner that year, who built a surfboard out of 10,000 discarded cigarette butts, inspired Nolan to take another crack at it. Nolan decided to push his creativity to the limit. He would build an entire surfboard from scratch, using unconventional materials. “I’ve become, personally, a little bit more aware of wastefulness and stuff like that, and some things like styrofoam cups really stand out,” he said. As a New Englander, he saw discarded Dunkin’ foam cups not only as a problem for the environment but also an excellent material for a flotation device. “From an objective point of view, it was a good option for making a surfboard,” he said. Around November 2017, Nolan, who grew up in Plymouth, started collecting used Dunkin’ cups anywhere he could find them, relying mostly on those closest to him who guzzled down coffees. As his cup count ticked higher, Nolan started the grueling and meticulous process of cutting and splicing them, brushing them with an environmentally friendly epoxy, and stacking them like shingles into a mold. From there, he compressed the foam down, over and over, to create two sides of the board. In all, Nolan said it took around 20 layers of cups — about 700 cups in all — to complete that part of the process. When it was finally done, Nolan affixed the sides together with bamboo stringer, shaped the board, and then coated it with fiberglass and more epoxy. For the fins, he said, he used plastic Dunkin’ straws and other straws to give the board a small pop of color. While he tracked the number of cups used, the hours spent in the garage working on the project (with the help of his wife, Rebecca, and other family members) got away from him a bit. Nolan kept people updated on his project by documenting the entire process on Instagram. At the end of August, he revealed the finished board. “Immediately people were reaching out to me and congratulating me on it and telling me how great it was,” he said. In October, the board won him second place in the 2018 Creators & Innovators Upcycle Contest, a redeeming moment for the designer after falling short the year before. These days, Nolan’s Dunkin’ board sits in his garage on a rack with his other surfboards, and only gets used every now and again, he said. Dunkin’, which recently rebranded itself, announced in February last year an ambitious plan to eliminate polystyrene foam cups from its global supply chain by 2020. In the US, the cups will be replaced with new double-walled paper cups that are currently being used in certain markets. While Nolan still has around 200 of the cups in his house, and could potentially build a second board if he collected a few hundred more, he’d rather just wait for the day when scavenging polystyrene foam is no longer an option.